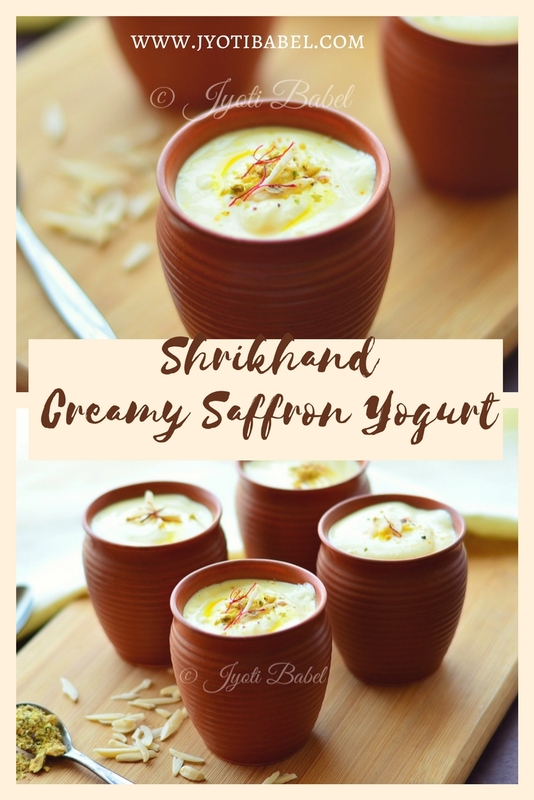 Shrikhand is the Indian flavoured thick yogurt. It is typically flavoured with cardamom and saffron. But, you can get as creative as you like. Flavoured yogurts are a rage these days, specially fruit flavoured ones. 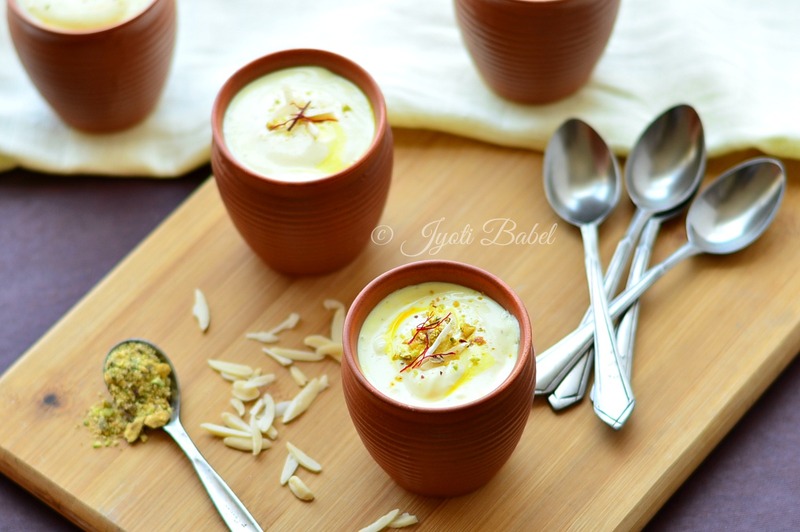 But, for me when it comes to flavoured yogurt, it has to be the traditional Indian Shrikhand. Although it is eaten throughout the country these days, it is said to be native to the states of Gujarat and Maharashtra. I don't like the ready to eat shrikhand you get in most supermarket aisles - they are made too sweet and seem to have some artificial flavor. The good news is that it is so easy to make Shrikhand at home. Serve it with your regular meal or make it as a dessert for a party menu - it will shine on both occassions. It is good for your gut and a must-have in these hot summer days. It is just that you have to plan it advance as you are going to need hung yogurt/curd for making it. If you can get your hands on Greek yogurt, you can whip this up in no time. Looking for some other dessert ideas with yogurt check out, Mango Shrikhand (Amarakhand), Mango Yogurt Delight, Misti Doi and Blueberry Fool. Making hung yogurt/curd is pretty easy too - but, it takes some time. Here is how you can make hung curd. Line a sieve with muslin cloth and pour your regular yogurt over it. Cover with a lid and leave it in your fridge for 3-4 hours- overnight is even better. The whey from the yogurt will drain out slowly leaving behind a thick creamy hung yogurt/curd. If you have 2 cups of yogurt you will get about 3/4 or at most 1 cup hung curd. 10 saffron strands, soaked in 1 tsp milk and rubbed in a pestle and mortar. Chopped pistachios and flaked almonds for garnishing. 1. In a large bowl add the hung curd, sugar, powdered cardamom and rubbed saffron. Using a whisk, mix everything together till all the ingredients are well blended and the yogurt is smooth and creamy. 2. Pour into individual serving bowls. Garnish with chopped pistachio and flakes almonds. Let it rest in refrigerator and take it out at the time of serving. Serve chilled. 1. You can also pass the yogurt mixture through a sieve for best results. But, it will be a bit messy with a couple of more utensils to wash.
2. Do not using a electric blender to mix it as it tends to liquefy the yogurt. You can however use an electric whisk to make things easier. This is one of my favorites :) love those stunning pictures...very appealing!! 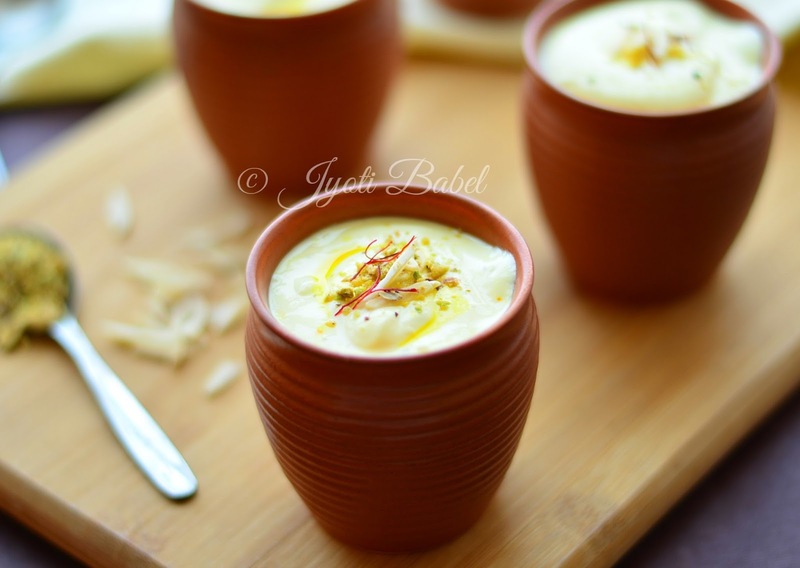 Lovely Shrikhand , just what we need in ghis hot scorching weather, loved the recipe. Your Shrikhand looks sooo creamy, rich and decadent. Classic dessert and sooo easy to make. I do agree compared to flavoured yogurts shrihand is better n homemade the best. Your generous serving of shrihand is yummy. I just love shrikhand and you have made it so simple to make it at home. Thanks for such an easy recipe. Perfect for this hot weather.. Your Shrikhand bowl looks super cute.. very neat presentation too..
Before I was vegan, we use to make this. Now I make this with coconut curd,gets almost same texture and flavor. Looks beautiful! So so amazing, loved each pic. One of my favourite especially during summer. Loved your presentation and looks yum ! Feel like inviting myself to your place, those shrikhand looks terrific, what a delightful dessert. Super likes. Shrikhand and puri is all time favourite. This looks delicious. Me too love the home made version of shrikhand. You made it so perfectly, rich and elegant. Lovely pictures too. Shrikhand looks very inviting, so far I have not tasted shrikhand. Will try soon to make one. Clicks are beautiful. This authentic and delicious Shrikhand is one of my favourite Indian dessert, rich and aromatic Shrikhand with Poori is a match made in heaven. I really need something like this now.It so hot here and we are looking for something chilling in this climate. The Shrikhand looks so delicious! Beautiful clicks. Nothing beats the taste of homemade shrikhand and just like you, I dont like buying them from supermarkets, they taste only sugar leaving behind the taste of the yoghurt and the lovely dry fruits / saffron that are actually the star ingredients of the dish. 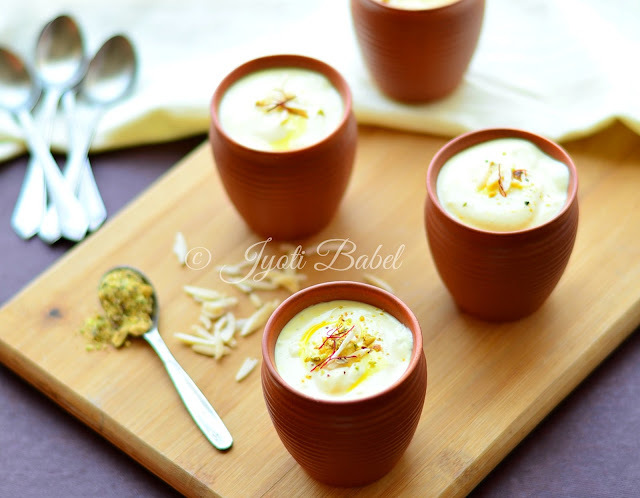 Shrikhand has to be light in sweet and should be deliciously creamy, yours certainly fits the bill. Beautiful images too.